Dundalk 10k Fun Run.... Again! It's been two years since I did the Dundalk 10k Fun Run and I'm about to do it again, in five weeks! I just decided yesterday morning. So, I donned my, now grubby, runners and stepped out into the cold. Well, in fairness, the weather has changed a bit here in Ireland. We are now experiencing something akin to Spring! At long last. It was a bitter Winter. When I began Weight Watchers back in 2010, running something like this was far from my expectations. In truth, I'm not a very sporty person. I hate contact sport (partaking, not watching because I actually love rugby). P.E. at school was a nightmare for me. We always had to play basketball or volleyball and being short, these things did not come easy to me. However, I really like running. It's just me and my music when I'm training and, when I did the 10k two years ago, the camaraderie was brilliant. Of course, there were people competing for first place but I was no where near that standard! You can find the original post about my first 10k here. Incidentally, when I went to get the link for that post, I noticed the comment below. I had forgotten about it. It's from my Aunt Margaret, who passed away a few months later. Cancer is such a horrible disease. I'm also hoping to lose about a stone from the training. I've been quite bold lately and need to get back on track. Yesterday I did 2.5km and this morning 2.6km. My thighs are killing me!! 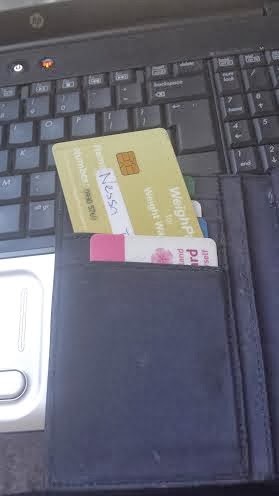 My Weight Watchers gold membership card is mocking me from my wallet! In other news, Devil in the Clouds is entered into ABNA and I'm back to working on my third novel, Allie's Return. It's like coming home. I got a new phone yesterday. I was due an upgrade from Three and went with the Samsung Galaxy S4. I love it! I don't know how to use all the features yet but I'm getting there. I've also downloaded the Kindle app and I'm reading The Great Gatsby by F. Scott Fitzgerald. I haven't seen the new movie yet but will after I finish the book. I love Leonardo DiCaprio in anything (except Titanic, which in my opinion, almost destroyed his career), so I'm sure I'll like the movie! This holiday has a tendency to make some single people bitter. In the past, years and years ago BB (Before Beth), I suppose it did annoy me when I was single on this day but I don’t feel like that anymore. It might be because I’m older now or maybe it’s the blonde beauty who lives with me! If I didn’t have Beth I might feel differently. She treats Valentine’s like Christmas. She has been counting down the ‘big sleeps’ all week and was so excited when I whispered “Happy Valentine’s Day” as she was waking up this morning. I’m just not very good at sharing my life with someone. I only want a part timer!! Last guy I had a few dates with seemed to suit me but he turned out to be even more afraid of relationships than me! And that’s some feat!! I do like going on dates though. The anticipation, the butterflies, even the dread. Sitting close but not touching, electricity fizzing in the open space, then the inevitable grazing of cloth followed by thrilling contact sending shivers all over your body. If you’re lucky, a kiss, gentle at first, as the passion builds, swirling, tasting, passionate. Yes, I like dates!